Trumpet vine is a native American vine that grows quickly and easily, especially in the south east. The vines blooms come in various shades of red, orange and yellow. It’s a beautiful vine that attracts hummingbirds while in bloom and birds after the flowers fade off. This hardy grower is used to hide the not so attractive parts of a landscape. It’s a very strong plant and should never be planted to climb on a home or your favorite tree. Choose a location for your Trumpet vine. Do not plant the vine where it will climb on your house, shed, garage or living tree. The vine is strong and can damage structures and kill trees. You will need a strong trellis, fence, pole or dead tree for the vine to climb. It can also be used to cover rocks and retaining walls. Dig a hole that is twice as deep and wide as the vines root ball. Amend the dug out soil with some compost to aid in drainage and give the vine some nutrition to help with root development. Place the vine in the hole and backfill with the soil half way. Water in the soil so there are no air pockets around the root ball. Continue to fill around the roots and press the soil down firmly. Spread some all purpose fertilizer around the soil but do not let it touch the vine itself. Trumpet vine does well in most types of soil and is not a heavy feeder. As long as the foliage is thick and green, you should not need to fertilize it again. Water the plant generously after planting and continue to water every other day for a week while the roots get established. Then water only when the soil is dry and water for longer periods of time. 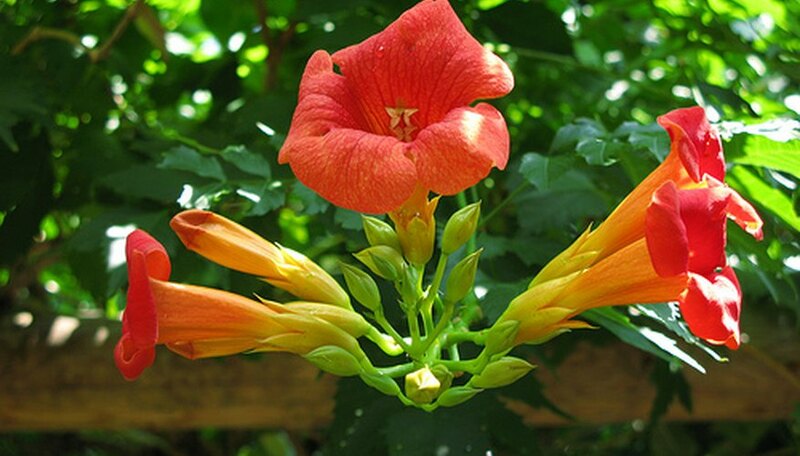 Trumpet vine is very drought resistant and will grow and flower better with less water than more. Pinch off the flowers as they start to die. This will encourage flowering on other parts of the vine. Prune the vine back in early spring or late fall. Pruning will help the vine to put out new shoots and thus new blossoms each year. Mow any areas around the vine where you do not want the vine to grow. Keeping the new shoots from coming up is a good way to control the vine from taking over your landscape. To keep the vine in one particular area it can be planted in a 5 to 10 gallon container. This will keep the roots from spreading any farther than the container.